Missing teeth can cause a whole host of problems, from difficulty eating and speaking, to poor nutrition and self-confidence. Fortunately, we have several excellent ways of replacing lost teeth. One of the most time-tested techniques is the dental bridge. A bridge is a prosthesis (replacement part) that relies on support from healthy teeth surrounding the gap left by a missing tooth or teeth. The artificial replacement tooth is called a “pontic” after the French “pont” for bridge. The healthy adjacent teeth, called abutments, provide support on either side — just like a bridge spanning a canyon. 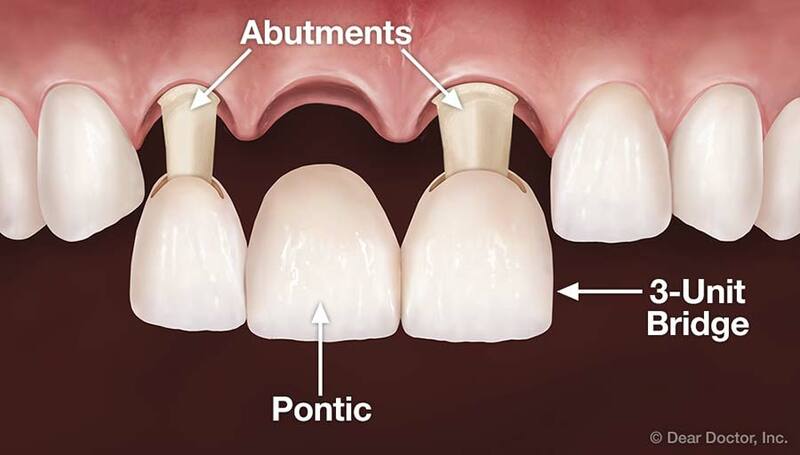 In order for the abutment teeth to provide this crucial support, they must be crowned or “capped.” The process for doing this is the same as if these teeth needed crowns for any other reason — trauma or significant decay, for example. First, the abutment teeth are “prepared” by removing their enamel thereby creating enough space for the crown to fit over and completely cover them while maintaining a lifelike appearance. The crowns on the abutment teeth will be attached to a false tooth (pontic) in between. The pontic is really just another crown; the difference is that it has no tooth underneath. If you have one missing tooth, your bridgework will require three crowns. Two of those crowns will cover abutment teeth on either side of the gap left by the missing tooth. These two crowned abutment teeth will then become supports for a third crown placed in between them, filling in the empty space. This arrangement is known as a three-unit bridge. If more than one tooth is missing, more crowns will be needed to bridge the gap in between the abutment teeth; in fact, more abutment teeth may also be needed. There are several variables to take into account in this calculation: the number of missing teeth, the size and length of the abutment tooth roots, the amount of bone support each abutment tooth has, as well as where in the mouth the teeth were lost. For example, if you have three missing teeth, four abutment teeth may be necessary, thereby creating a seven-tooth bridge. Engineering and designing the bridge requires an understanding not only of how to replace teeth, but also of the biology of tooth-supporting gum and bone tissue. Getting bridgework usually takes two visits to the dental office. At the first visit, your abutment teeth will be prepared as described above, using local anesthesia to minimize any discomfort from drilling. Because three-dimensional models of your teeth are needed to construct the crowns, a mold of your prepared teeth will then be taken using a putty-like impression material, or digital scanning equipment. The 3D models of your teeth will aid the dental laboratory technicians who will actually make your crowns. You will receive a temporary bridge to wear before you leave the office. When your permanent bridge is ready, it will be cemented in place during a subsequent visit. A brief transition period may follow, during which you become accustomed to the feel of the new bridge against your tongue, lips, and cheeks, and accept it as your own teeth. Please remember that your crowned teeth require the same conscientious care as all your other teeth. Be sure to brush and floss every day to reduce the build-up of dental plaque. 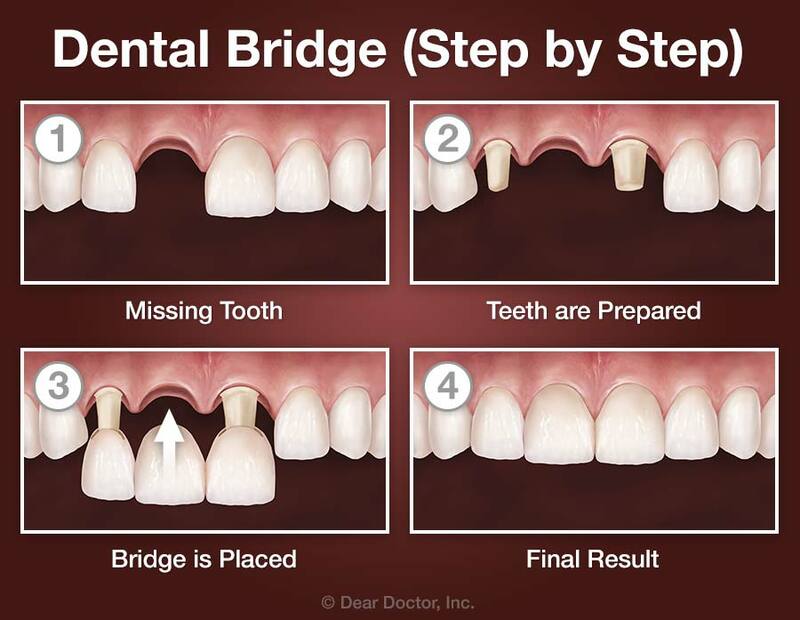 When you have a bridge, it is even more important to maintain your regular schedule of cleanings at the dental office. It is not unusual for a well-cared-for bridge to last for a long time.